IT IS hard to imagine a 96-year-old jumping out of a plane at 4300 metres and cutting through the air at a breezy 200kmh, but that is what George Taylor did this week. The tandem skydive was his sixth since 1999 and fifth in the past five years. George said he loved to brag about his adventures to his friends who were of a similar age. "I am going to do a jump every year while I'm fit and healthy. It's about the only good times I have," he said. "I lead a very quiet life usually. "I'm going to continue to do it yearly because there's nothing else to do." George was not alone in the plane. His 14-year-old granddaughter Jade jumped too. Skydiving has become something of a family tradition, stemming from George's son, Keith and wife Morrell, of Buderim. Jade said she enjoyed sharing such a great experience with her grandfather, who lives in Townsville. 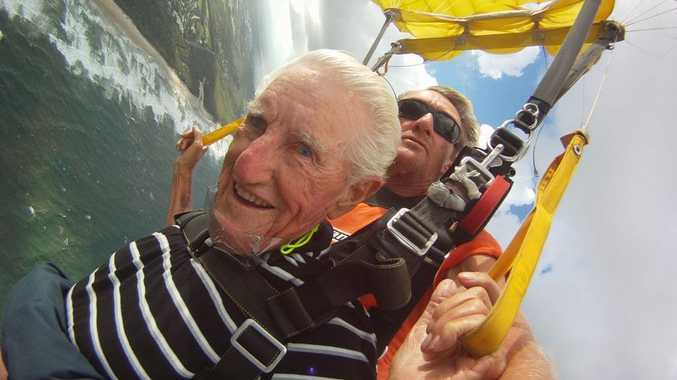 Due to George's age, he had to get his doctor's okay before taking the plunge with Skydive Ramblers Sunshine Coast at Marcoola. Darren Harvey, skydiving instructor at Ramblers, who jumped with Jade, but who has jumped with George before, said although George's age made him more at risk of a heart attack or other complications, they approached the jump like normal. "He knew the risks, but everything went to plan," Harvey said. "It was a fun, emotional rollercoaster for the pair." Keith said he intended to jump with his dad on his 100th birthday. "It will be a family affair," he said. "We will all jump."